For a musical style born out of rural Kentucky, and initially popularized by a single band, bluegrass has a surprising knack for attracting people from all walks of life. For Jordan Brandenburg (Mandolin), Michael Rudolph (Bass), Bridger Dunnagan (Fiddle), Dave Pailet (Guitar), and Alex Koukov (Banjo), bluegrass has been a way to connect with others, to make friends and to cultivate joy, so it’s no surprise that community is at the center of their band ethos. The five friends, who comprise Denver’s next big bluegrass band, Turkeyfoot, share momentous instrumental talent, an enthusiasm for collaboration, and some serious songwriting chops. 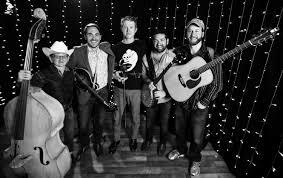 The band originally honed their tight groove playing around one condenser mic at a weekly local jam, and have firmly instilled themselves in the hearts of Colorado’s bluegrass community. As a realtor, a family physician, a landman, a barista, and a fine cheese salesman, they know their beloved Denver from many angles, and the connection shows. This past year, Turkeyfoot took second place in the Rockygrass Band Contest, a coveted prize that has launched the careers of band such as Nora Jane Struthers and Front Country. Although the band fell shy of winning, they were the top Colorado band to place. “The most surprising thing for me was the amount of support we were shown from the spectators, we were really feeling the home state love” explains Brandenburg. Although Denver is now home for the band, they aren’t all native Colorodans. Band founder and mandolin player Brandenburg is originally from Texas, and studied at Oklahoma State University before coming to Colorado for a job in the energy industry. The band’s name, Turkeyfoot comes from the big bluestem grass that grows across the prairies of Oklahoma and Texas, and beyond. “I grew up playing music in Texas, but when I started my job I had just kind of stopped playing entirely. I was watching Sam Bush playing at Telluride Bluegrass Festival a few years ago and I just had this moment of thinking, ‘What am I doing? Why am I not playing music?’” Dealing with a tough breakup and feeling lonely in a new town, Brandenburg soon found his way to jams and music parties and formed Turkeyfoot with bass player Rudolph. As the band progressed and got more serious, Dunnagan, Pailet, and Koukov all gradually and organically joined the lineup. “I actually met Jordan the first time I ever played at Cerebral Brewing in Denver.” explains Dunnagan. “It was Jordan’s birthday and he threw a huge afterparty. About a year after that, we crossed paths again, and he was like ‘Hey, be in Turkeyfoot!’”. Originally from London, Alex moved to Boulder, Colorado at age 12 and fell in love with the banjo and bluegrass music in high school. He furthered his musical interests in college at Montana State, where he met Bridger, Turkeyfoot's fiddle player. His musical influences include, but are not limited to, Ron Block, Earl Scruggs, Dan Tyminski, and Justin Timberlake. When not playing music or prospecting for gold, Alex enjoys biking, fine wine, and cured meats - he is a true ray of light. Bridger grew up in Bozeman, Montana and began playing the fiddle at age of 10. It wasn’t until age 18 when he first became enamored with bluegrass after attending a picking party in Bozeman and began practicing in order to join the fun. Bridger is heavily influenced by old-time and traditional styles of fiddle and some of his influences include: Bruce Molsky, Jason Carter, Bobby Hicks and many others. He is a fan of macaroni and cheese, coffee, cooking, kayaking and yoga. He also lives with a mountain lion named Martin. One of the two Denver natives of the band, Dave got into bluegrass music in high school listening to the infamous Pizza Tapes (if you don’t know, look it up), as well as Yonder Mountain String Band. His musical influences beyond that include, but are not limited to, Bill Monroe, Flatt & Scruggs, Darrell Scott, Rob Ickes and Blue Highway. Dave loves sub sandwiches with “all the meats and cheeses in the world” and Tazo Peach Tea. When he’s not playing flat top or sideways-hubcap guitars, he is learning something else with strings. Oh, and please refer to him as “Pastor Dave”...he’s not religious, but he WILL convert you to bluegrass. Growing up the son of a minister in Tyler, Texas, Jordan was introduced to music at an early age in church, but didn’t become interested in bluegrass until high school. He quit playing music upon graduation from Oklahoma State University to pursue a career in energy until he moved to Denver, found a new mandolin and met the folks in the local bluegrass scene. His musical influences are Sam Bush, Wayne Benson, Guy Clark, Tim O’Brien and Ernest Hemingway, to name a few. He continues his corporate side gig while also chasing feather, fin, fur, adventure and tacos. Another Denver native, Michael first started playing bass at age nine, taught by his mother, a prolific acoustic musician. Throughout high school, Michael played with his family band, the Southwest String Band. In college, he led a bluegrass music interest group, and has remained active in the scene on the Front Range while studying to be a family physician...seriously. Aptly nicknamed “Dr. Bass”, his influences include: Todd Phillips, Barry Bales, Alan Bartram and Mike Bubb and many others. His other hobbies include antique Polaroid collecting and eating his mom’s baked goods.